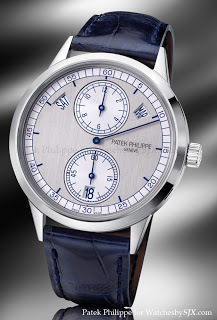 A few days ago I made a post about the new Patek Philippe 5235 regulator with annual calendar. It will be launched officially on 22 June 2011 in Geneva. What I know now is that the white gold case is 41 mm in diameter, and the new 31-260 movement is 2.53 mm high. The seconds are at six o’clock and off-centre hours are at 12.